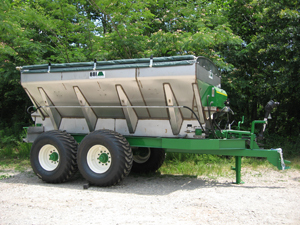 MagnaSpread 14' or 16' Tandem Axle Fertilizer Lime Spreader - High Capacity - Pull Type - Distribution of Granular Fertilizer or Lime - Option Rich - Customized for your specific application - Advanced Technology for the most sophisticated farmer! Spreads Fertilizer in 80' PLUS swaths! No Electronics, 30" BOB, Painted carbon ladder, S6 CV PTO, Overslung Inverted "V", Cast Hitch, Hy Torque Manifold, GR Valve High Torque Manifold, High Duty Hydraulics with Oil Cooler, and SS spinners and fins are standard and included in list price.